When you’re in Maine, there are a number of rare treats you’ll want to track down besides the best lobster in the world. 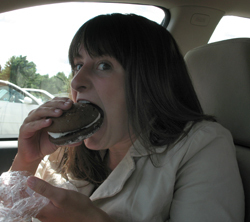 Emma and I love two Maine staples, common to the working class downeast; red hot dogs and whoopie pies. The best place to find them in Hancock County are at the Eggemoggin Country Store or, as the natives call it, B&L’s (it was established years ago by Billy and Lorna… but, that’s another story).